Comedy is better because of Jeffrey Gurian! He is to comedians what Lester Bangs will always be to musicians! (Google it!) That being said, read this book!Trust me, it’s funny! I like that there is a new book of comedy in time for Hanukkah and the holidays. I think people will truly enjoy this. We loved this book so much, we bought two copies! We wish we were triplets so we could buy a third! You can’t spell “HUMOR” without “GURIAN”! But then you’re left with some superfluous letters, and honestly that’s not good! Being a “Real Housewife” demands having a good sense of humor and I know funny when I see it. Jeffrey Gurian is ALWAYS funny. If I was ever shipwrecked on an island with Jeffrey and had to choose between food or laughter, I’d choose food because Jeffrey would supply all the laughter we’d need. Read this book! For growing up as the son of a liquor salesman in The Bronx this kid is FUNNY! 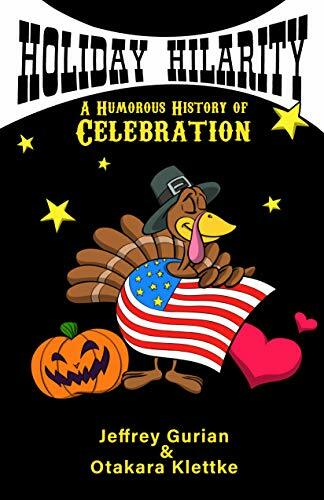 This book is gut-splitting comedy mixed with fun and unusual historical facts! Jeffrey Gurian is NYC’s gift to comedy! “Can I get drunk on kosher wine?” And “Do I have the manual dexterity to spin a dreidel?” - Questions I’m now in need of answering after wiping the tears and snot off my face. A hilarious performance by talented author Otakara Klettke and comedian Jeffrey Gurian. No one cares more about the art of comedy than Jeffrey. No bigger champion of the art form and celebrating it, as you can tell from reading this fun book!